Bill Villa's alcoholism, drunk driving, and former(?) long-time illegal drug abuse permeates almost every aspect of his hate-filled life and hate blogging. Certainly, it has played a role in his lifelong professional failure -- he only recently landed a near-entry-level job suitable for late twenty-somethings at the retirement age of 62 (Bill Villa, Creative Director, Allebach Communications, Souderton PA) -- ironic given his habit of falsely claiming many of his “Foes List” victims are failing in their careers or businesses. Worse still, it drives him to continually make a spectacle of himself and dishonor the memory of his daughter tragically killed by a drunk driver much like himself. Not only are Bill Villa's delusions the worst thing in his life, but by driving his demented, belligerent lies, reputation vandalism, and violent references against others, it has caused considerable damage to the lives of his nearly 60 “Foes List” victims. 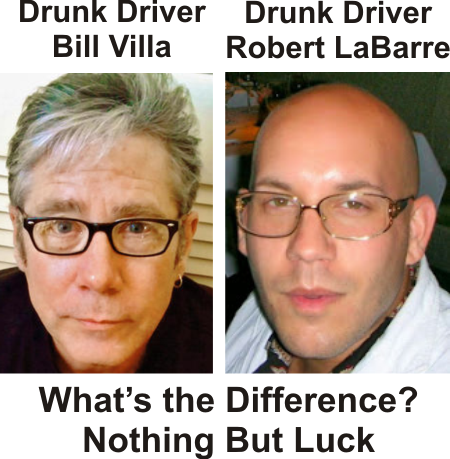 One of Bill Villa's favorite smears against his “Foes List” victims is to falsely and baselessly accuse them of being alcoholics and/or drunk drivers as he is. Bill Villa baselessly -- indeed delusionally -- blames nearly 60 of his community’s finest citizens (his “Foes List”) for events following his daughter’s tragic death at the hands of a drunk driver like himself -- smearing them with vicious and outrageous lies and often menacing them with references to violence.